Metsä Tissue's mill in Krapkowice produces about 75,000 tons of sanitary paper per year. Products include toilet paper, kitchen towels, paper towels and professional wipes, both for individual customers and industrial use. Aug. 27, 2018 - Metsä Tissue announced that a project to expand the warehouse at its tissue mill in Krapkowice, Poland, is underway and the company expects the project to be completed by the end of 2018. Pawel Ehrlich, Plant Manager in Krapkowice, added, “This investment is good news for our plant as well as a clear signal from the Metsä Group about the further development of the factory. The expansion of the warehouse, which will actually double its capabilities, helps us to be competitive and to operate effectively in the coming years." Metsä Tissue is part of the Metsä Group, one of the largest industrial groups in the world of wood processing. 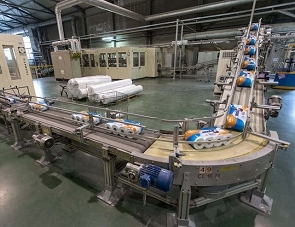 The tissue plant in Krapkowice produces about 75,000 tons of sanitary paper per year. Products include toilet paper, kitchen towels, paper towels and professional wipes, both for individual customers and industrial use. The mill employs about 380 people. Metsä Tissue is a leading manufacturer of tissue papers, baking papers, cooking papers and facial tissues. To learn more, please visit: www.metsatissue.com.